Whether you hike, bike, paddle or stroll, you will have the time of your life in our outdoor mecca, which boasts a bevy of recreational opportunities that are either in or quite close to our delightful small towns. So, pack an overnight bag and a cooler. Put the bike on the rack and get your road trip playlist all lined up. You’re heading to Lake Lure & the Blue Ridge Foothills! 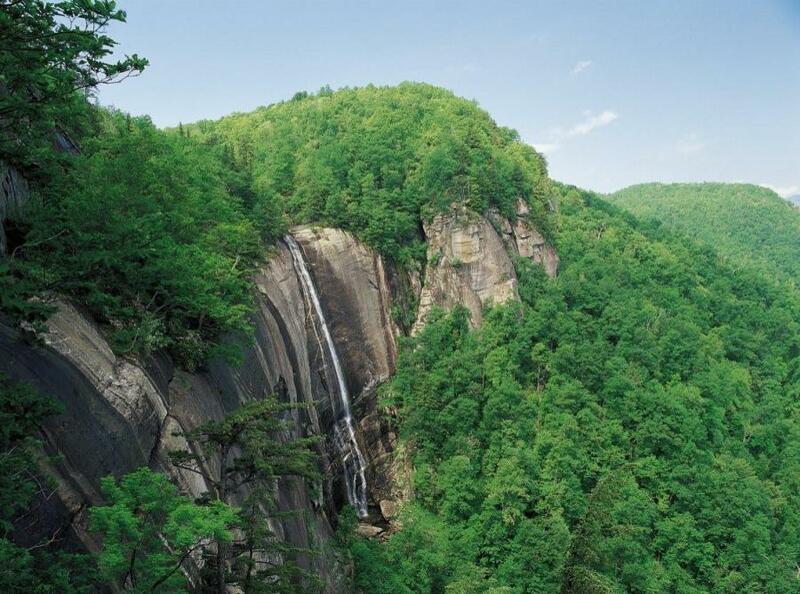 Climb Mother Nature’s “Ultimate Stairmaster” by taking the 499 steps to the top of Chimney Rock at Chimney Rock State Park where a rewarding 75-mile panoramic view awaits you. Dogs are welcome, and the Park even has a Great Woodlands Adventure trail designed specifically with curious kids in mind. Featuring 12 “Discovery Stations,” this kids trail is an easy hike, especially if you don’t want to climb to the top of Chimney Rock. Across town in Lake Lure, get the family dog in on the action by hiking through Dittmer-Watts Nature Trail. It features ten easy-to-moderate trails networked across just under four miles of lush forest. It’s so pretty and quiet in this park, you’ll forget you’re super close to restaurants and shopping. In Rutherfordton, check out the Purple Martin Greenway and explore wildlife and waterways. This new trail has already doubled in size with plans to double again by 2018. Push Your Limits, Bike Backcountry! 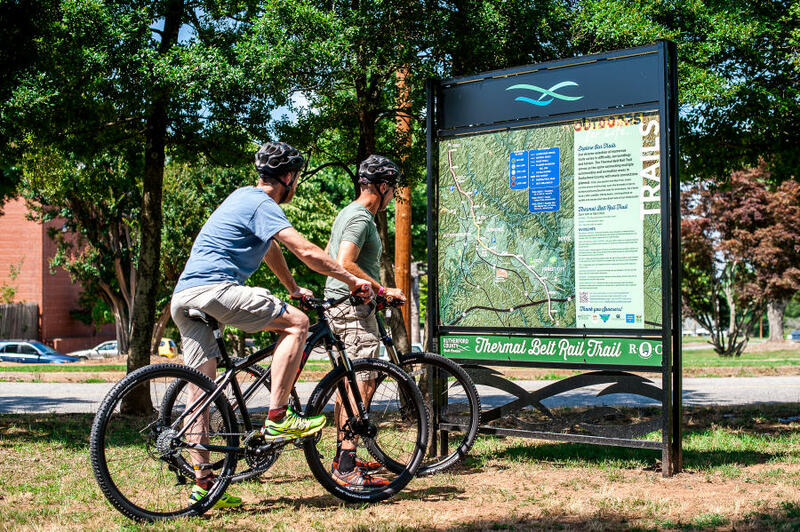 Known as one of the best biking trails in Western North Carolina, Buffalo Creek Park has the only mountain bike trail system within a 20-mile radius of Lake Lure. With 4.5 miles custom engineered for this sport, bring your own bike or rent one locally. This is an intermediate to advanced switchback loop trail with another eight miles of rugged ‘out and back’ cycling and hiking nearing completion. In Rutherfordton and Spindale, try the Thermal Belt Rail Trail. This 7.8-mile biking trail was originally a railroad line that moved textiles in and out of the county. The trail is ideal for hiking/walking, running and dogs. The Broad River Paddle Trail is 41 miles of class I/II paddling and tubing adventures. With several access points, the river is broken into multiple sections allowing you to choose your endurance level or tackle the full stretch. Hire a professional kayak guide, rent tubes, or bring your own gear. When Hiking & Biking is just too ambitious, why not stick with a stroll? 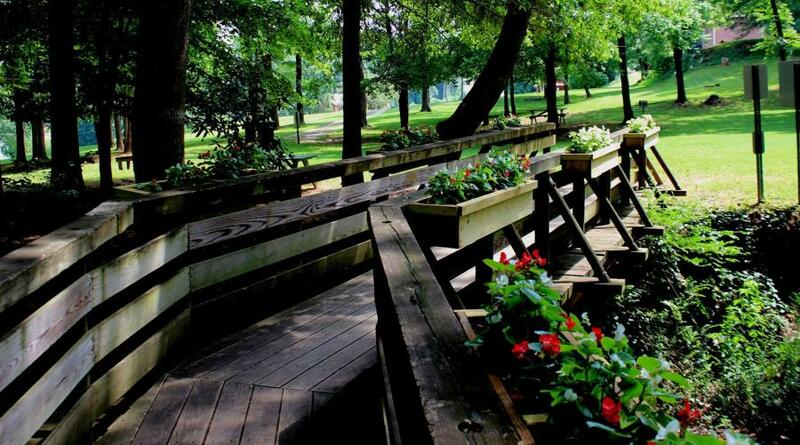 Sometimes, all you want is a leisurely stroll to take in all the beauty of nature around you. 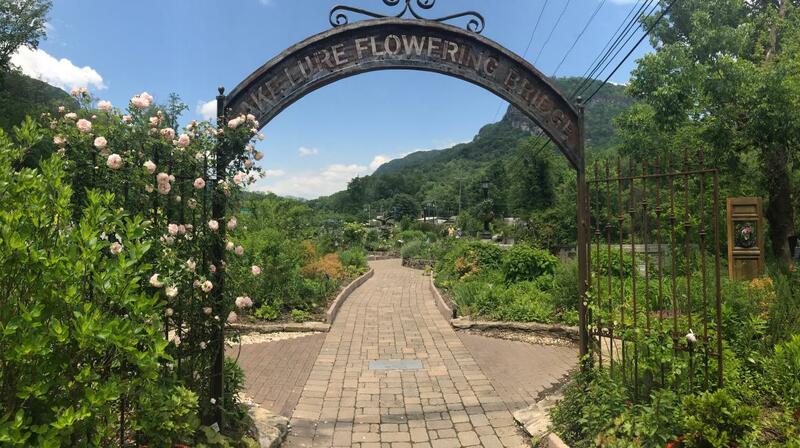 For those times, the Lake Lure Flowering Bridge is a must-experience destination. This iconic landmark is only the second of its kind in the country boasting more than 700 species of plants and flowers, including a sensory garden for the visually impaired. In Rutherfordton, take the kids on the Main Street Safari featuring games, tree climbing, gold hunting, and a search that goes through a Civil War cemetery or take a walk on the Historic Downtown Walking Tour that takes you back in time while passing antebellum homes, shops and restaurants. Also part of the Historic Downtown Walking Tour is the Gold Mile, a one-mile loop that follows commemorative sidewalk coins in honor of Christopher Bechtler who minted America’s first one-dollar gold coin in Rutherfordton. The Gold Mile begins and ends at The Bechtler House on 6th street, the headquarters of the N.C. Gold Trail.